Are Investors Normalizing Deviant Events? Who Really Did Cause The Flash Crash? Themis Trading is an independent, no-conflict, institutional agency brokerage firm specializing in equities. The purpose of our blog is for a discussion of market structure issues as well as general market commentary. Please note that third-party posts do not reflect the views of the Company and have not been reviewed by the Company for completeness or accuracy. BOSTON GLOBE: "Did you read something for Flash Boys you would recommend?" LEWIS: "Scott Patterson’s Dark Pools, which overlaps with my own book some. What he does really well is tell the early history of automated electronic trading. 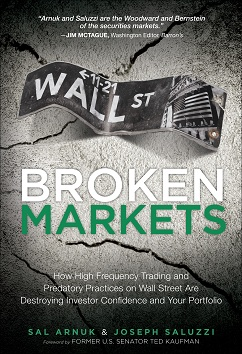 I’d also recommend Broken Markets by Sal Arnuk and Joe Saluzzi and the 1923 novel Reminiscences of a Stock Operator by Edwin Lefèvre."